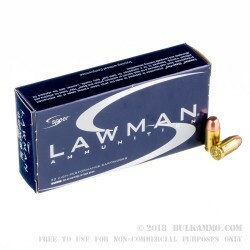 This Speer Lawman 45 GAP ammunition comes packaged 50 rounds to a box and 1000 rounds to a case. 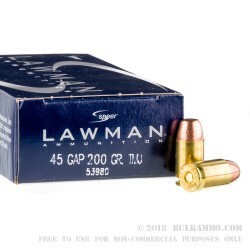 Containing comparable bullet weights and velocities to the Gold Dot varieties, the Speer Lawman 45 GAP rounds are the perfect blend of performance and affordability for training and target practice to deliver a realistic and practical shooting feel. 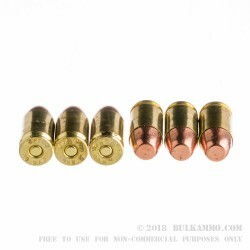 The bullet has a grain weight of 200 and is encased in a total metal jacket (TMJ). 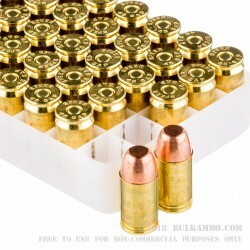 This bullet is loaded into a non-corrosive, boxer-primed, heavy duty, re-loadable brass case. And carries an impressive muzzle velocity of 990 feet per second, and a muzzle energy of 435-foot pounds. If you’re looking for a reliable training round, this is it! Designed by Ernest Durham, an engineer at Speer, and at the request of Glock Firearms, the .45 GAP (Glock Auto Pistol) was built to have equal power and the same diameter as the .45 ACP, but with a more durable case head and shorter length to be able to fit in compact handguns. Law enforcement agencies quickly adopted this caliber because of the widespread use of concealed carry subcompacts, but as of today, Glock and Bond Arms are the only manufactures that still make pistols in the .45 GAP caliber.